Melanie Nutter is running in the BART Board SF Elections to make BART clean, safe, and reliable. Too often demands for public safety come at the expense of the liberty of young people of color. BART needs to address the random violence in the system in a way that engages the community, works with BART Police, and protects the rights of all riders. I will oppose the use of facial recogntion software and other invasions of privacy and believe BART should develop a data policy to ensure privacy. I will advocate for comunity engagement to provide trained accompaniment to sit in designated cars and walk people to their cars at night. The homelessness crisis is felt acutely in the BART system, as far too many people use BART as their only place of refuge. We need to address this issue with compassion and use social workers to guide those in need to available services. We can no longer look the other way. BART as a system looks and feels old, because it is. The stations and trains are falling apart under the stress of increased ridership and underinvestment. We need to invest in our core services to provide riders with efficient, timely, affordable, and renewable powered transportation systems. I began my career as a grassroots organizer for Green Corps, a field school for environmental activists and learned early on that having a voice whether in politics, in your community or your workplace, is critical to a thriving and functioning democracy. While there are periodic surveys taken of BART riders and their satisfaction levels, I will champion new and innovative programs for receiving and responding to rider input on a regular basis. This will help to build trust among the ridership and also empower riders to share their views, wants and needs with the BART management. As a sustainability professional, I am interested in continuing to advocate for the Sustainability program at BART. A 2010 study found that BART reduced over 1 million metric tons of carbon dioxide per year and the system eliminated 127 times the emissions it produced through its own service. Through additional support of this program, BART can continue to play a substantial role in reducing carbon emissions in the Bay Area and provide a viable alternative to single occupancy vehicles. Specific areas of focus will be environmental performance, community experience and operations and system resilience. I will also want to make sure that the 2 renewable energy contracts that were approved last year are on track and will be online by the goal of 2021. Promoting transit-oriented development projects will also be a priority for me. Finally, the Union members that are responsible for ensuring that BART is a thriving, functional regional transit system everyday need a champion on the BART Board and I intend to be a voice for the needs of labor on the Board. 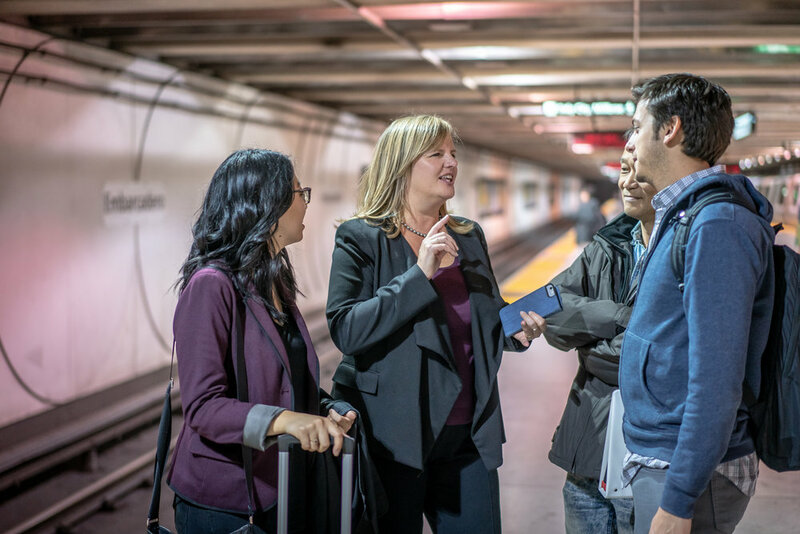 As a BART Director, I will nurture a collaborative and productive relationship with labor. Other policy areas that are of interest and where I could contribute are station place making, fleet and system modernization and transit-oriented development.